Located on the Central Pacific coast of Costa Rica in the Puntarenas province, Jacó town (greater area population 10,000) is filled with activities for everyone. Jacó lies between several mountains and is flanked by the beaches of Herradura Bay to the north, and Playa Hermosa to the south (not to be confused with the other Playa Hermosa located in northern Guanacaste). With a population of just over 10,000, and less than a 1.5-hour drive from San Jose, Jacó boasts the title of closest beach to the capital city. With this desirable proximity, it is no wonder it is the hotspot for city dwellers to enjoy a tropical beach weekend. The lively beach area is clean and spans approximately 2.5 miles in length, with greyish-white colored sand. With its enticing waves you are sure to find the beginner to intermediate surf set there, as well as more experienced surfers in nearby Hermosa. The professional beach break waves of Hermosa play host to many international surfing competitions throughout the year, and have helped to put Costa Rica surfing on the map as an alternative to other surfing destinations of Hawaii, Australia, and South Africa. The beach itself is not built up with beach bars like some other tourist-friendly Pacific beaches, instead in the evenings, locals and tourists come out to stroll, jog, walk their dogs, or just sit and enjoy the sunset—making it a very active beach at daylight’s final show. The Central Pacific coast tends to see a bit more rain annually than their northern neighbors, which makes the surrounding jungle eternally green and lush. However, even in “green season” you see sunshine part of the day, and rarely have torrential downpours. The temperatures vary from highs typically around 85 F to 90 F during the day and 75 F to 80 F at night, making it a perfect place for those who like consistent tropical warmth. The town of Jacó boasts an exciting vibe like no other beach town in the country. Locals describe it as “Metropolitan culture meets beach chill.” There are several Vegas style casinos and a variety of bars, making the nightlife perfect for those revelers who like to have some fun gambling or dancing the night away. And if you like to leave the cooking to someone else, there are 100 different dining and drinking options with everything from 5-star to casual. Choices such as seafood, Italian, Peruvian, Costa Rican, French, Asian, vegan, craft beer microbreweries, and wine bars are all at your fingertips. And, dinner and a drink out can be as cheap as $18 per couple at a local soda (small snack stand). Sportfishing is extremely popular around Jacó, and restaurants will cook your own fresh catch-of-the-day for you with various choices of delectable cooking styles and flavors. But Jacó is not just about weekend parties. There is a strong expat community which mixes in with the local ticos (native Costa Ricans) making the full-time residents about a 50/50 mix. Residents have gone to great efforts in recent years to make Jacó a family-friendly place to visit and live. There are parks, jungle gyms, and many restaurants with kid-friendly menus. The Jacó Walk, an open-air mall opened in 2017, has activities and performances for the entire family. The local feria (farmer’s market) is open every Friday from 6 a.m. to 2:30 p.m. There you can socialize with the local community while you purchase fresh produce, artisanal breads, cheeses, and other goodies. Still not enough? Any given weekend you will find festivals focused on art, dance, beer, and even ceviche. The surrounding area of Jacó possesses all the North American products and services required to live comfortably, such as medical clinics, major grocery stores, mechanics, pharmacies, clothing stores etc. Playa Hurradura, just 10 minutes north, is the home of a large expat complex with an18-hole championship golf course, a luxurious JW Marriott Resort, and the largest marina on the west coast of the country. The nearest large hospital complex is in San Jose for major medical procedures. Jacó’s downtown is fairly compact with most activity on the main road through town, so it is easy to live in Jacó and not own a car. There are some red metered taxis and Uber’s, making it easy to get around if you don’t feel like walking or biking. Jacó can also be a place to relax and unwind. On the tranquil side you will find an artsy and spiritual community focused on yoga and healing. It is the perfect place to do everything or nothing at all, anything goes in Jacó. Jacó is one of the few places in Costa Rica with so many choices of housing directly on the beach, including a multitude of mid to high-rise residences. Long-term or short-term rentals are easy to find, such as two-bedroom, two-bathroom condos with modern amenities for $1,100 per month. If you are looking in Hermosa, average rent runs closer to $800 per month. Home purchase prices vary based on location, views, amenities, and walkability. A two-bedroom, two-bathroom home on the edge of town can be found for $135,000. A high-rise condo with a partial ocean-view starts at $165,000, while a beachfront two-bedroom, two-bathroom condo costs $199,000 and up. 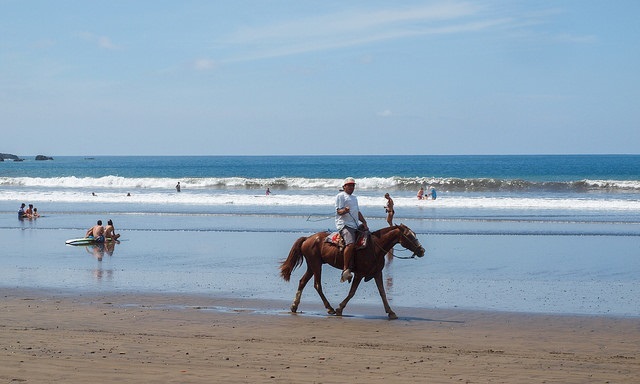 If you are looking for an energetic pace, beautiful beaches, international cuisine, glorious tropical heat, and an abundance of amenities, look no further than Costa Rica’s playground—Jacó Beach.